The Grauer School's recent Annual Spring Gala gave one student musician the chance of a musical lifetime. On Saturday, May 2, The Grauer School hosted its 9th Annual Spring Gala, "Our Future is Bright and Green" at the Hilton Del Mar. 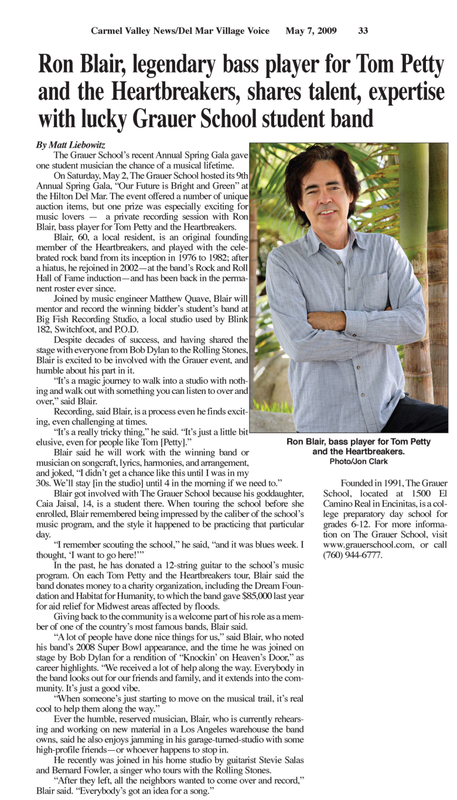 The event offered a number of unique auction items, but one prize was especially exciting for music lovers -- a private recording session with Ron Blair, bass player for Tom Petty and the Heartbreakers. Blair, 60, a local resident, is an original founding member of the Heartbreakers, and played with the celebrated rock band from its inception in 1976 to 1982; after a hiatus, he rejoined in 2002 -- at the band's Rock and Roll Hall of Fame induction -- and has been back in the permanent roster ever since. Joined by music engineer Matthew Quave, Blair will mentor and record the winning bidder's student's band at Big Fish Recording Studio, a local studio used by Blink 182, Switchfoot and P.O.D. Despite decades of success, and having shared the stage with everyone from Bob Dylan to the Rolling Stones, Blair is excited to be involved with the Grauer event, and humble about his part in it. "It's a magic journey to walk into a studio and walk out with something you can listen to over and over," said Blair. Recording, said Blair, is a process even he finds exciting, even challenging at times. "It's a really tricky thing," he said. "It's just a little bit elusive, even for people like Tom [Petty]." Blair got involved with The Grauer School because his goddaughter, Caia Jaisal, 14, is a student there. When touring the school before she enrolled, Blair remembered being impressed by the caliber of the school's music program, and the style it happened to be practicing that particular day. "I remember scouting the school," he said, "and it was blues week. I thought, 'I want to go here!'" In the past, he has donated a 12-string guitar to the school's music program. On each Tom Petty and the Heartbreakers tour, Blair said the band donates money to a charity organization, including the Dream Foundation and Habitat for Humanity, to which the band gave $85,000 last year for aid relief for Midwest areas affected by floods. 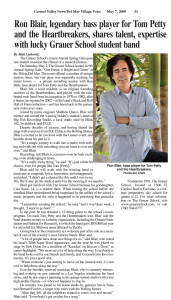 Giving back to the community is a welcome part of his role as a member of one of the country's most famous bands, Blair said. "A lot of people have done nice things for us," said Blair, who noted his band's 2008 Super Bowl appearance, and the time he was joined on stage by Bob Dylan for a rendition of "Knockin' on Heaven's Door," as career highlights. "We received a lot of help along the way. Everybody in the band looks out for our friends and family, and it extends into the community. It's just a good vibe. "When someone's just starting to move on the musical trail, it's real cool to help them along the way." Ever the humble, reserved musician, Blair, who is currently rehearsing and working on new material in a Los Angeles warehouse the band owns, said he also enjoys jamming in his garage-turned-studio with some high-profile friends -- or whoever happens to stop in. He recently was joined in his home studio by guitarist Stevie Salas and Bernald Fowler, a singer who tours with the Rolling Stones. "After they left, all the neighbors wanted to come over and record," Blair said. "Everybody's got an idea for a song." Founded in 1991, The Grauer School, located at 1500 El Camino Real in Encinitas, is a college preparatory day school for grades 6-12. For more information on The Grauer School visit www.grauerschool.com, or call (760) 944-6777.